When it comes to tired, hackneyed British cop dramas, our tolerance is somewhat limited. But when you transpose the same beats and tropes into a foreign language affair, there’s an illusion that makes the endeavour seem almost exciting, and exotic. But just because the characters don’t sound like Vinnie Jones doesn’t mean they couldn’t be portrayed by him – which is the case for Benjamin Rocher’s uninspiring drama The Sweeney: Paris. As the title suggests, the film is a remake of Nick Love’s The Sweeney (2012). A franchise which begun life as a TV series in the 1970s – and you could argue that even one revisiting was superfluous, never mind two. 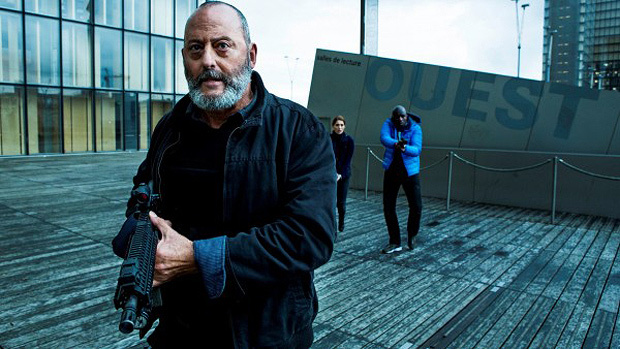 Jean Reno tackles the role that once belonged to Ray Winstone, as that of Serge Buren, the uncompromising leader of a police unit that thrive in not playing by the book. With a loyal, diligent collective around him – consisting of his reliable assistant Cartier (Alban Lenoir) – they feel best equipped to trace down and capture a nefarious criminal roaming the streets of Paris, having savagely murdered a young woman following the robbery of a jewellery store. However when the new police commissioner Becker (Thierry Neuvic) stamps his authority and takes this unconventional unit off the case – without their insider knowledge, many more innocent civilians could be at threat. Evidently influenced by the likes of Tarantino, Mann and Ritchie, it appears that the filmmaker favours style over substance, and the slickness and rhythm to Rocher’s dialogue is the most vital aspect, and everything else works around it. The main concern is where that next punchy one-liner is going to come from. There’s no realism to this piece as a result, but in fairness, that’s not what it’s going for, though that said, not all of the dialogue quite works… “I don’t need stability, I’m not a table” one of the character declares. Accidental Partridge klaxon. The piece is quite ego-led too, like Tarantino’s work, except without the suaveness to pull it off. It’s like the filmmaker wants to impose his own pop culture tastes into the movie, so in a contrived fashion he forces them upon his characters, using them as a vessel. Like Cartier, who lists musicians who died at the age of 27, naming Amy Winehouse, Brian Jones, Jim Morrison – but this knowledge doesn’t match the sensibilities of the character at hand, which is emblematic of a feature that has so little character development. Meanwhile, Reno spends the entire film looking as though he just wants to be somewhere else. 1994, probably. But the film is endearingly meta in that regard, as the character of Buren is reflective of the actor himself, as he’s not particularly fashionable in France any more. He’s considered part of the old guard, old-fashioned almost, and this feels like it’s not just the character making a statement of his validity, but the actor, too. The whole notion this film thrives upon is that of needless progression, and the yearning to preserve tradition. The unit are by no means up to date, they’re hard-nosed and old-school and this film romanticises over such an approach. To be honest though, they’re a little careless and perhaps dissolving the unit isn’t such a bad idea. Just saying. But Rocher revels in this sentiment, presenting his film as an ode to classic, 80s action movies, almost saying that this type of film is still relevant, protesting to the audience in a similar vein to how the unit are to their new commissioner. Whether you agree with that sentiment or not, at the very least you can certainly agree that this picture doesn’t take itself too seriously at all, which, believe me, is its one and only saving grace. The piece is quite ego-led too, like Tarantino's work, except without the suaveness to pull it off.